The German Shepherd Border Collie Mix, also known as Shollie and German Collie Mix is a hybrid breed with the German Shepherd as one parent and Border Collie as the other. In this post, I’ll cover everything you need to know about this large active breed Shollie including its looks, health, color, temperament and suitability as a home pet. Do you know German Shepherd and Border Collie are one of the most active, agile and protective dog breeds you can find? Naturally, their mix breed takes after its parents. The German Shepherd Border Collie Mix is an active, athletic looking dog. However, like most hybrid breeds how they may look, behave, or respond to social life is often unknown. Simply put, Hybrid breeds are complex and difficult to understand. But there’s one thing for sure! German Shepherd Border Collie Mix is a large athletic dog. Although some individuals may be a balanced mix of both parents, some take more after a single parent. That being said, let’s take a quick look at various facts of this beautiful intelligent Collie Shepherd mix breed. Where did the German Shepherd Border Collie Mix come from? Like Shollies, the exact origin of Border Collie breed is unknown. However, it is thought that they first came into notice in Scotland. The early Collies were bred to protect herd and livestock. Pretty much the same thing they do today! Modern-day Collies are immensely active and hardworking dogs. You can find them working as sheepdogs on the ranch or as a beloved home pet. The other parent German Shepherd is one of the finest herding breeds. First discovered in Europe, Shepherds soon gained popularity among masses as herding and guide dogs. In extreme weather conditions, the Shepherd is an ideal pet known for their work ethic and stamina. They are also extremely popular in disciplined sectors including military, police, and service work. However, they are also a great household favorite and make a great companion while providing security to your home. German Shepherd Border Collie Mix is a cross between Border Collie and German Shepherd. Let’s take a quick look at their personality traits now. German Shepherd Border Collie Mix Temperament: What I am Getting Into? Are you thinking of bringing this designer and adorable Collie Shepherd Mix into your home? Then you should better get familiar with the temperament of this large sized dog to decide his suitability as your new family member. Because Shollies are a hybrid mix of two active and intelligent parents, Border Collie and German Shepherd, you can rest assured that they’ll be highly active and strong animals. However, don’t picture them as being aggressive. Shollies are playful dogs and love to interact with human beings. Protective and instinctive, they only bark when something or someone suspicious enters their territory. This trait has made the breed great guard dogs, who look after their own family and kids. German Shepherd Border Collie Mix Personality: How will these adorable dogs behave? As with German Shepherds and Border Collies, Shollies are highly trainable, instinctive and intelligent. These dogs have gained a huge popularity as designer dogs who can also protect your home. Shollies have an extremely energetic, playful, and lovable personality. Also, they can be very protective of their home and owners. So, expect them to bark whenever they will sense something fishy. These dogs are very active and will need mental and physical stimulation to stay fit and healthy. Further, you should be prepared to train your Shollie friend as soon as you bring them home. This will help to make them more social and prevent their protective instincts from kicking in every time they see a stranger. 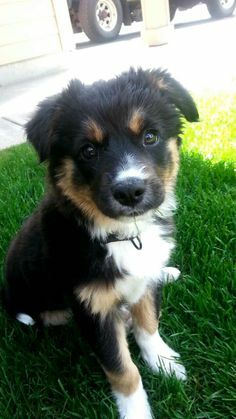 German Shepherd Border Collie Mix Looks: They’ll be large for sure! It can be quite a gamble with a hybrid breed, to say the least. How a German Shepherd Border Collie Mix will look cannot be predicted as they can take more after a single parent and less after another. As a general observation, Shollies look more like a purebred German Shepherd with their tan coats and athletic large body. What gives them away, however is their slightly floppy ears and a Border Collie tail. 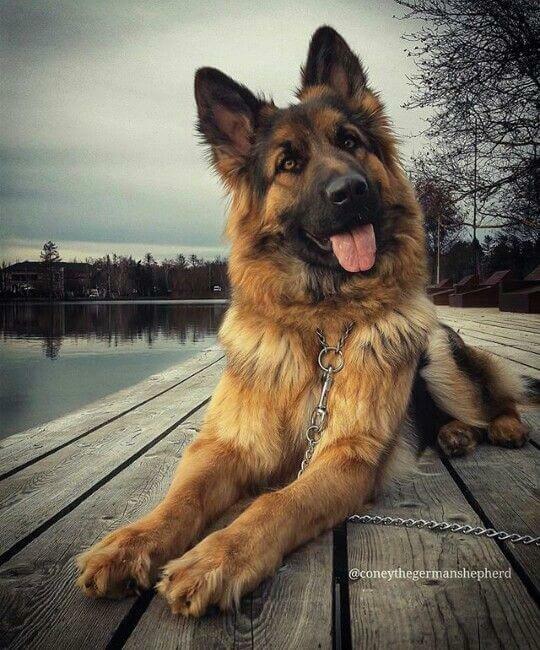 Pure German Shepherd dogs have a bushier tail and Shollies have a less bushy small tail with a more hairy body. Overall, these cute pups will grow up to become large active and adorable dogs with highly expressive eyes. Predicting what color will your Shollie pup inherit from its parents is fairly difficult. If the hybrid mix inherits German Shepherd traits, it will more likely have a solid color coat with a little black saddle. 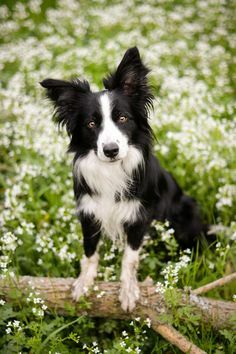 If they take after their Border Collie parent, they may have one of the 17 colors adorned by a Border Collie. Now, let’s talk about the coat. German Shepherd Border Collie Mix will very likely have a silky and smooth coat with short-medium length. This also means they will require weekly grooming. So, be prepared for that if you’d love to have this hairy pet at your home. Border Collie German Shepherd Appearance: Will I be able to pick and cuddle them as they get older? A lean and muscular body, Collie Shepherd can weigh around 75-80 pounds and stand about 22-29 inches tall. Border Collie German Shepherd Training & Grooming: What to Expect? Because Shollies have two highly intellectual parents, their training can be a breeze. Training Collie Shepherds from the very beginning is considered very important. This is the first step to make them sociable and friendly. For more information on How to train a puppy, you may visit this link: Click here. They can easily catch on any fun tricks you may show them. But make sure to train them with a positive approach rather than a passive approach. Shollies can become stubborn and aggressive when punished frequently. They will respond well to a pat on the back or an occasional treat. Shollies tend to shed a lot, especially during seasonal changes. Invest in a good hair vacuum cleaner and a quality brush because your four-legged friend will need weekly brushing. Border Collie German Shepherd dogs are highly-energetic breeds. So, you will need to plan their daily walk to be long and at least twice. A fair amount of one hour walk will be sufficient for your athletic friend. Make sure they are not cooped up in a corner for too long or they may become irritable and aggressive. These dogs need physically active owners and aren’t a good choice if you tend to get lazy yourself. Further, this breed suffers from hip dysplasia. It is very important to maintain their regular exercise and keep a watch on his weight to ensure they enjoy a long and healthy life. Any kind of dog, whether purebred or hybrid is prone to hereditary and age-related health problems. Just like us, humans! Looking into specific health problems of a Collie Shepherd Mix, the most common ailment they tend to suffer from is hip dysplasia. Being large dogs, they are more prone to this problem. Other common health problems include eye diseases, Degenerative Myelopathy, and other allergy problems. Make sure to feed your large friend high-quality dry dog food twice to keep him healthy. Or if you have the time, fresh prepped homemade dog food is the way to go. How Long Is Your Shollie Dog Expected to Live? A mixed-breed dog has the same lifespan as their parents. On an average, German Shepherd Border Collie Mix can live somewhere between 13 to 15 years. Should You Adopt a German Shepherd Border Collie Mix? A German Shepherd Border Collie Mix is a cross-breeding of highly-active and intelligent dog breeds. This dog will need a lot of physical and mental activity along with social training as a pup. These extremely playful and fun-loving dogs love to interact with humans and can be very protective of their owners. If you’re looking for a hard-working companion for your home, Shollies are a perfect companion for you. However, these dogs cannot be scooped up in a corner of your home and need large space to play and run around. So if you’re living in an apartment, these dogs are not a good fit for you. You should also consider twice before adopting a Shollie if you’re a first-time dog owner. These dogs can be a handful and need an owner with hands-on experience with energetic and sensitive dogs. All in all, German Shepherd Border Collie Mix can be your ideal loyal friend for years to come if you train it well and love having a friend to accompany you for those long walks in the park. Do you have any questions? Suggestion? Or anything to say at all!? Feel free to comment it down below and we’ll be happy to help you out with anything and everything! Having an existential crisis? We’ll help you out with that, too!